The Washington Interscholastic Activities Association released its brackets for the state basketball tournaments in all classifications Tuesday morning. Clark County fans won’t have to travel far to see six teams. Union and Battle Ground will play each other in a Class 4A state regional game Friday in Longview. And on Saturday, the La Center boys, Prairie girls, Columbia River boys, and King’s Way Christian boys all play at Battle Ground High School. Six other teams from Clark County will hit the road, traveling away from the WIAA’s District 4 (Southwest Washington) for state regional games. Half of the state regional games are for seeding purposes only. Of the 16 teams that qualified for regionals, those with the top-eight RPI rankings will play for the right to go straight to the state quarterfinals. The losers of those games will still advance to the final destination for each classification, but in the round of 12. Teams with RPI rankings 9 through 16 will play elimination games at state regionals. Win and advance. Lose and be done. Here is a look at all games involving Clark County teams., starting with the games in District 4, then the games played away from Southwest Washington. The Tigers (18-8) are on quite a roll. And after what they have endured recently, traveling to Longview will feel like a home game. Battle Ground’s last six games were in Olympia or Tacoma. The Tigers went 5-1 in those games, qualifying for state. Union (23-1) has been No. 1 pretty much all season in the RPI. The Titans won their first 22 games of the season before losing in the semifinals at bi-district. 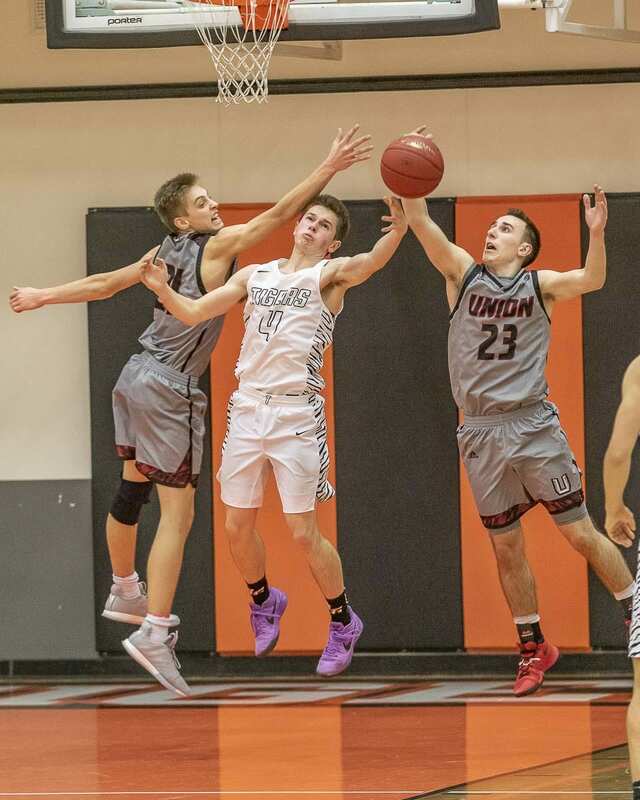 Union swept the Tigers in league play. Battle Ground led at the half in the first outing, though. Oh, and if you are wondering how two teams from the same league are playing each other in state regionals? This is not an elimination game. Both teams are going to the Tacoma Dome. There is no rule against league teams facing each other in this round if it is not an elimination game. Still, this is the first time two Greater St. Helens League teams have played each other in this round in this relatively new format. And because it happens to be Battle Ground to make it this game, it had a big effect on Union. The Titans have to travel a little further now than they would have otherwise. Battle Ground High School is the only approved site in Clark County for a District 4 regional. Rules state teams cannot play on their home floors. So this game is now at the next closest gym, in Longview. Winner advances to quarterfinals at Tacoma Dome on Feb. 28. Loser goes into the round of 12 at Tacoma Dome with an elimination game Feb. 27. La Center (21-2) lost to top-ranked Lynden Christian in the second game of the season. Since then, just a one-point loss to King’s Way Christian, another team in the state tournament. Deer Park (20-2) opened the season 17-0. Winner advances to quarterfinals at Yakima Valley SunDome on Feb. 28. Loser goes into the round of 12 at the SunDome with an elimination game Feb. 27. Prairie (21-2) went all season without a loss to a Washington team until the semifinals of the 3A bi-district tournament. Bethel stunned the Falcons. Prairie responded in the third-place game. Still, that loss got their attention. This team’s only goal all season has been a state championship. Arlington (17-5) has won eight of its past nine games to make it into the top eight in RPI. Loser goes into round of 12 at Tacoma Dome with an elimination game Feb. 27. Columbia River, strong all year, seems to be playing even better right now. The Chieftains (21-2) lost to a 4A team that was ranked in the top-10 all year and a strong team from Idaho. That’s it. They have won 16 in a row, including three district tournament games by winning margins of 26, 26, and 35 points. Selah (17-5) has won 10 of its last 11 games. The Knights (15-8) started the season 2-5, playing a tough schedule, and getting better throughout the season. They even have a win over No. 2 La Center this season. Overlook (15-6) is on a six-game winning streak. Winner advances into round of 12 at Yakima Valley SunDome with another elimination game Feb. 27. Loser is done for the season. The Prairie Falcons (17-7) are one of the hottest teams in the state, winners of 14 in a row, including two wins over 3A Greater St. Helens League champion Kelso, a team that is No. 5 in the RPI. Prairie, which finished second in the league, is coming off a bi-district championship. This win streak vaulted the Falcons up the RPI, putting them into this position of going to the dome no matter what happens in Friday’s game in Spokane. Mt. Spokane (21-1) lost in its fourth game of the season to Gonzaga Prep, one of the top 4A programs. Winner advances to 3A quarterfinals at the Tacoma Dome on Feb. 28. Loser goes into the round of 12 at the Tacoma Dome with an elimination game Feb. 27. King’s Way Christian (16-7) at one point lost six consecutive games this season. Then the Knights won 13 in a row before losing in the district championship game. The Trico League champions know they belong in state. Medical Lake (17-6) also had a tough stretch in late December, early January. Medical Lake responded with a 10-game win streak. Winner advances into the round of 12 at Yakima Valley SunDome with another elimination game Feb. 27. Camas (16-9) tied for the 4A Greater St. Helens League title, won the tiebreaker, then took advantage of the No. 1 seed to win its first two games in the bi-district to earn a third consecutive trip to the state tournament and fourth appearance in last five seasons. Not bad for a program that only made state two other times. Now the focus is on returning to the Tacoma Dome. Camas has done that the past two seasons. Chiawana (18-6) won 10 games in a row at one point this season. Chiawana also won back-to-back elimination games in order to advance to state. Winner advances into the round of 12 at the Tacoma Dome with an elimination game Feb. 27. Washougal (19-4) has only lost one game to a Washington opponent this season, and that was to a 4A program. The Panthers were too talented in the 2A Greater St. Helens League and only had one game decided in single digits, and that was a nine-point game. The competition got closer in district, but the Panthers got battle-tested with close victories to win that tournament. They have won 13 in a row. East Valley (19-3) has two losses against Clarkston, the No. 3 team in RPI. Winner advances to 2A quarterfinals at Yakima Valley SunDome on Feb. 28. Loser goes into round of 12 at SunDome with an elimination game Feb. 27. Seton Catholic (18-6) plays in one proud league. The Trico League earned all three state tournament berths from 1A District 4. The Cougars lost in the district opener, then won four consecutive elimination games to make it to the state round of 16 for the first time in program history. Bellevue Christian (15-7) is looking for its second consecutive trip to the state round of 12. Bellevue Christian has won nine of its past 11 games. Winner advances into round of 12 at Yakima Valley SunDome with an elimination game Feb. 27. Hudson’s Bay (19-6) is in the state tournament for only the third time in program history and first since 2007. The Eagles earned it, big time, by winning three consecutive elimination games in the bi-district tournament, with all three games being played in the Puget Sound area. Roosevelt (17-7) won as many as seven games in a row in the middle of the season but has been up and down for the past month, going 6-4 in the final 10 games. Still, Roosevelt got the final two to make it to state.